All of our products except furniture are held in stock and we aim for a next day delivery to UK mainland addresses on orders placed before 2pm. If an item is not in stock it will be listed on the product page with an indication of when it is due back in stock. If there are any unexpected delays that we are not aware of at the time of order placement then we will contact you with this information by e-mail the same day. When you placed your order, we emailed you a tracking number. Enter your Tracking Number and Email Address below to track your order. 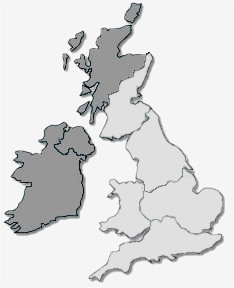 Orders for the Scottish Highlands, the Channel Islands (Jersey and Guernsey), the Isle of Man or Ireland (see darker grey areas on map below) will all be charged at £9.95. Please also note, export shipping charges are estimated. At check out you will be charged for one box only. If the purchase is large and needs to be packed in more than one box we will advise you that additional shipping charges will be due before shipment can be sent. Payment for these additional costs can be added to your original method of payment. For more details, click here and read our delivery terms and conditions. When the courier delivers your parcel it will be necessary for the recipient to sign for the parcel as proof of delivery. Therefore it is important that someone is available to receive the goods at the given delivery address. If no one is available to sign for the goods our courier service will attempt re-delivery. Unfortunately if this happens again the goods are automatically returned to us. In this instance we will attempt to contact you. If you would like us to re-attempt delivery we will have to charge you the carriage costs that are incurred. Alternatively we can refund your order as long as the item(s) are not personalised and we are able to re-sell them. For full details of our delivery policy, please visit our terms and conditions page.